Since October 2013 I have been using PhraseExpander Pro v. 3, and then v. 4, on a daily basis. (I have discussed the reasons for switching to PhraseExpander before here, and I also mentioned some crucial improvements to its algorithm here.) PhraseExpander has become an essential part of my writing setup, and not only because it is triggered by every single keystroke I type (though that is an important part of it). I use its SmartComplete feature not only to reduce the amount of repetitive typing, but also to help me remember long strings of coding (e.g. the HMTL code for inserting images or highlighting text in Gingko) and the aliases for anonymised people and organisations in my research. 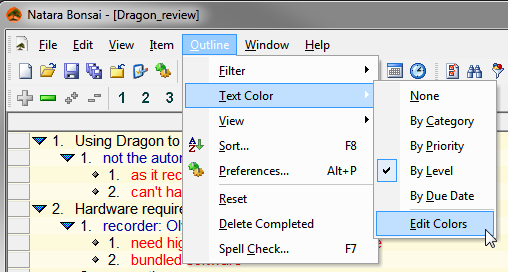 In this post I just wanted to point out an improvement that was released in today’s version of PhraseExpander and which greatly improves the way it works in browsers. In previous versions the SmartComplete box would need to be manually positioned, and it would be stuck in the same position, regardless which part of the browser you were writing in. But in v. 4.3.0.1 now the SmartComplete box pops up right by the cursor, which makes it a great deal easier to use in a browser. This will be extremely useful when writing in an online service such as Gingko app, where different cards reside in different parts of the browser. 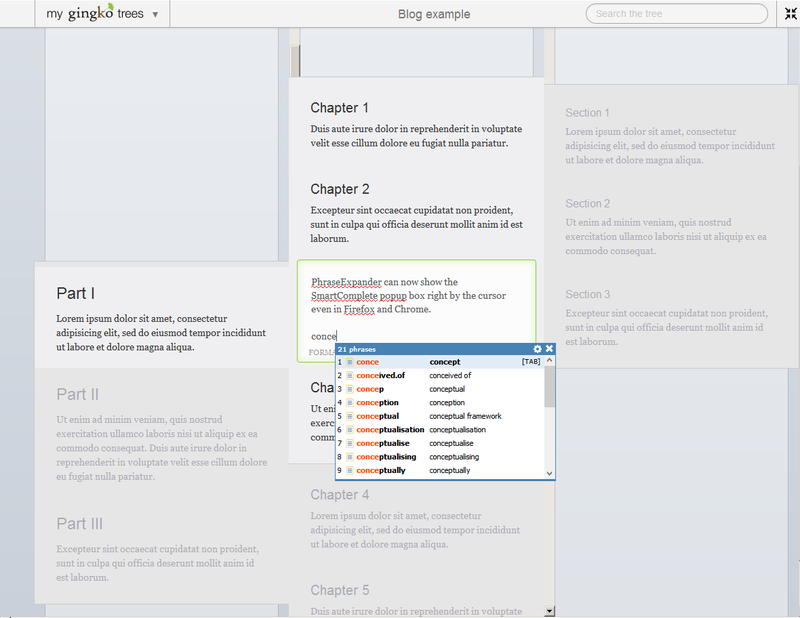 Below is a screenshot of PhraseExpander’s SmartComplete box displayed by the cursor in Gingko in Firefox. I also tried it in Chrome, and it works the same. See the rest of the latest changes to PhraseExpander here. P.S. In the meantime I have discovered a number of other important benefits to the new handling of browsers in PhraseExpander. Now the SmartComplete box is displayed correctly in Chrome apps as well (i.e. standalone Chrome applications that can run offline), such as the one for WorkFlowy, which I use daily. Also, it can now be used more easily with Google Sheets and Google Docs, and to write emails in browser-based email services. I’m just taking a moment here to reflect how I manage my to-dos these days. I’m not saying this is a great system. But currently it works for me. I work with three monitors on my desk. In the left monitor I have Firefox open with four tabs open all the time. I switch the monitor on and off, as needed. For times when I’m not at my desk, I have an iPod Touch and an iPad, which form part of the system. The first open tab in Firefox has Google Calendar in Week view. The calendar contains all appointments, recurrent tasks (such as payments I need to make), and other important tasks that must be done at a particular day and time. It is not for managing small or detailed tasks or tasks that have not been allocated to a time coordinate. All Google Calendar tasks have an automatic alert set up to warn me 10 minutes before the task is due. These also go off on my iPod and my iPad. I can’t miss them. In the second tab I have a Google Doc/Drive spreadsheet open called “Productivity.” Here I manually log how many Pomodoros I had done each day, how long they’d lasted, and what task I had accomplished (in one word, such as “writing,” “editing” etc.). At the end of the day I add up the Pomodoros to count how many “pure productive hours” (all work time excluding breaks) I had done. I know that I can do roughly 4 “pure hours” of writing a day, and so if I had done less, I push myself to try to achieve that goal. If I’m writing, I also record the word count I had done during each Pomodoro. To time my Pomodoros, I use an iPod app called Repeat Timer. In the third tab I have WorkFlowy open. It has become an absolute life-saver for me. I was able to consolidate all my other to-do lists that I used to keep in a variety of iPod/web apps before. But WorkFlowy is more than just a to-do manager. It is also a project management tool for me, as it allows me to break down tasks ad infinitum (what’s called a “work breakdown structure” in project management). And it is also an outliner. As a PhD student, many of my tasks are writing-related, and so often a to-do is actually a writing task of some sort. WorkFlowy is an amazingly flexible tool for managing infinitely long lists and infinitely deep hierarchies. And it’s also a note-taking application for me, for taking very short notes. The iPod and iPad apps are particularly helpful for taking notes on the go, and they are synced automatically with the web version. My fourth tab is a new experiment. I started a project plan in Gingko (which is a very funky horizontal outliner and more), using the month > week > day structure described here. This project plan is purely for planning and tracking the writing of my PhD, and I am planning and recording only the big chunky tasks that I want to accomplish each day. So it could be just one big task, or 3 or 4 smaller tasks, but never more. The point is to have a bigger picture of my overall project and the bigger daily tasks. Most directly this Gingko “calendar/journal” has replaced Classic Calendar for me for this kind of day-to-day planning and tracking. Classic Calendar is great, but Gingko is somehow more fun to use, and its Markdown code allows me to create checkboxes and cross tasks off, which was not possible in Classic Calendar, and is something I find very satisfying for some reason. The final piece of my task management jigsaw puzzle is iDoneThis. They send me an automatic email at the end of every day to ask me what I had done today, which gives me an opportunity to reflect on what happened today and take stock of my progress. The email gets converted to a task list on their web-based calendar, which can be downloaded in text form. Looking at my “system” above, I have just noticed that I seem to be moving more and more towards minimalist, text-based solutions. Other than Google Calendar, all the services I use are black and white or grey, and the content can be exported in basic text form. That should help with archiving the data and making it sure that it remains easily readable for some time to come.